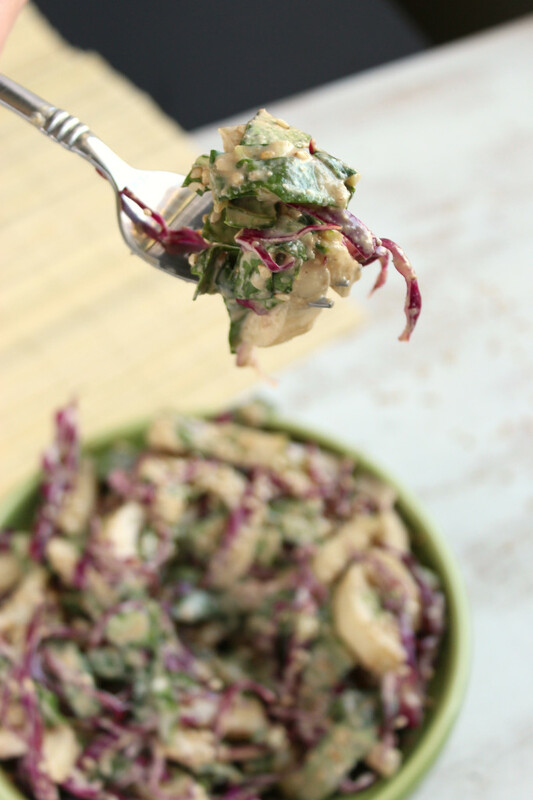 Crunchy, fresh, and uber-healthy bok choy takes on a new meaning when tossed with a generous helping of tahini-esque dressing. There was a time when we made this dish 3 or 4 times per week. I don’t get sick of it. It requires nothing more than a blender and a large bowl, involves no cooking, and is done in less than 10 minutes. Once you taste the tangy, sweet, creamy sauce, you’re going to want to put it on everything and dip everything in it. 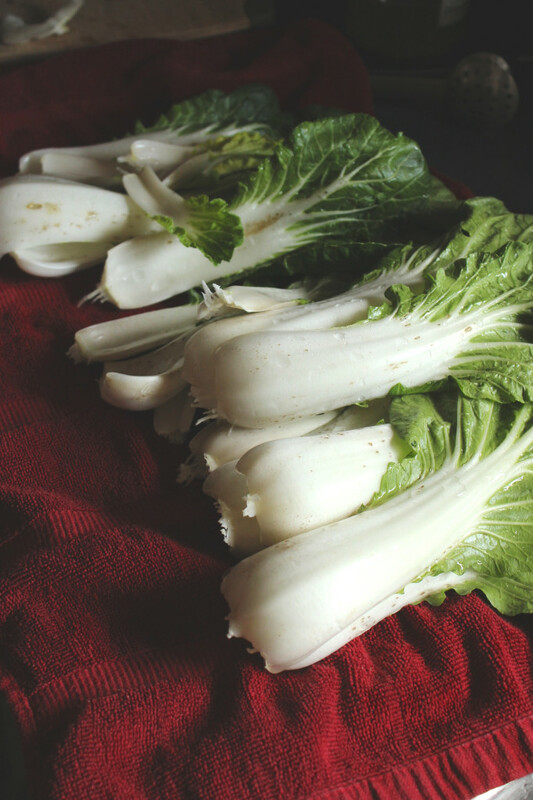 Bok choy is such a versatile, inexpensive, healthy veggie. After we tried it for the first time, we started buying it ALL. THE. TIME. This salad became an staple, and so did this bok choy and mushroom tart, along with the recent addition of Asian soba noodle soup. As you can see, there’s not much you can’t do with bok choy. This recipe, in particular, has a special place in my heart. We ate it all of the time because bok choy was cheap and we were broke – it’s still cheap and we’re still broke. It tasted so good that it didn’t really matter that we were eating it so much. At least we were getting our vitamin C, right? On top of bok choy’s many charms, I also appreciate the simplicity of this dish. I think everyone can agree that cleaning multiple pots, pans, bowls, and spoons eventually gets old. One bowl. 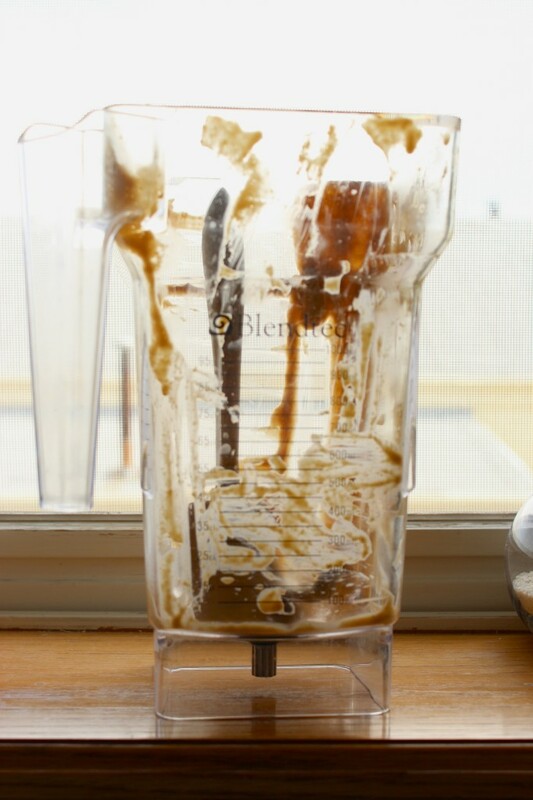 One blender. Boom. 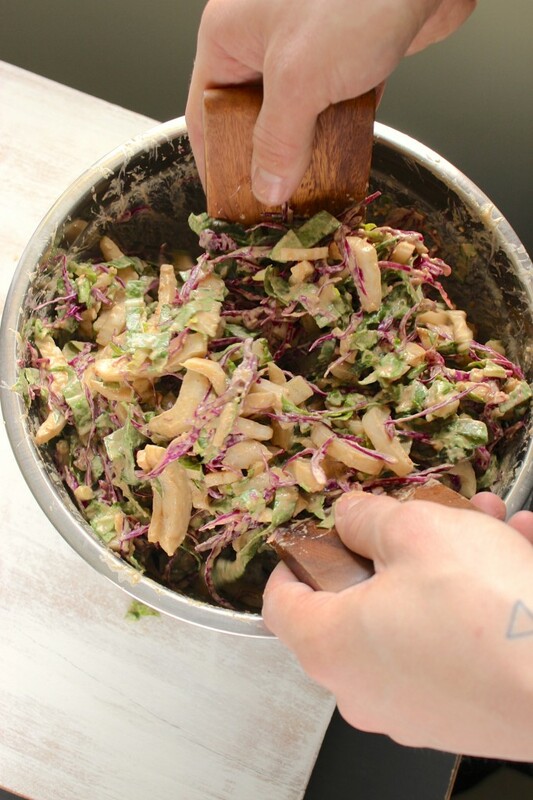 The last few times that we’ve made it, we’ve been adding super-thin sliced red cabbage to the mixture. 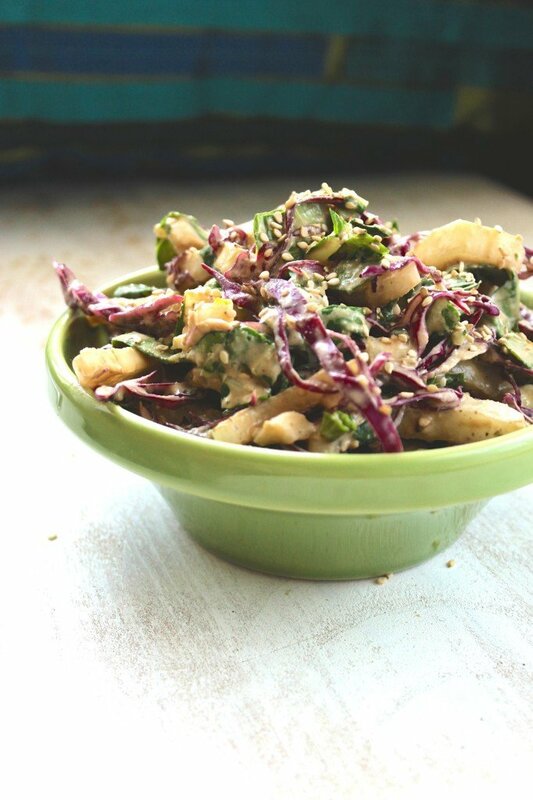 It adds a beautiful contrast and some additional flavor and crunch. Carrots are another good addition, if cabbage isn’t an option. 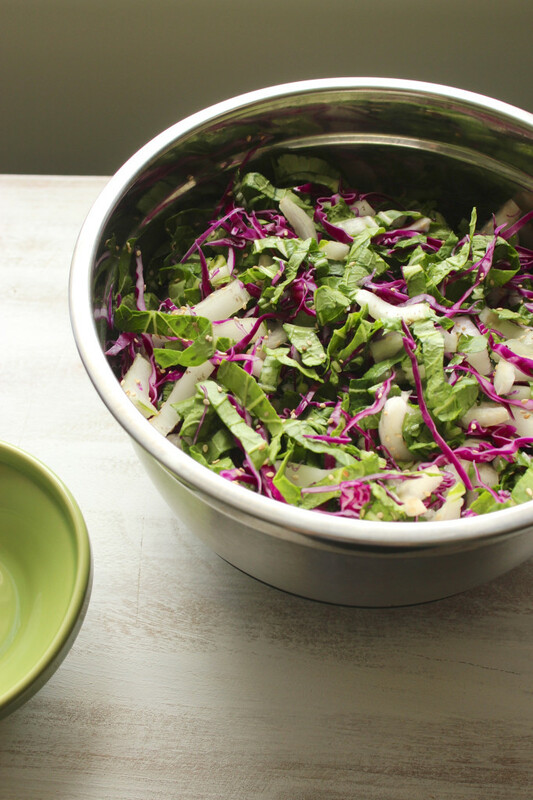 I recommend cabbage, for obvious reasons – see how pretty it looks?! I could recommend this as either a main dish or as a side dish, depending on what your portion size looks like. Don’t let the fact that it is a “salad” fool you. A heaping bowl of this is more than filling enough to count as dinner all by itself. It would also be a tasty way to complement something crunchy and crispy like eggplant burgers or goat cheese stuffed quinoa nuggets. Since it’s finally spring and summer is right around the corner, I’m thinking this is perfect for bringing along to Easter dinner, Memorial Day, and countless other warm weather gatherings. 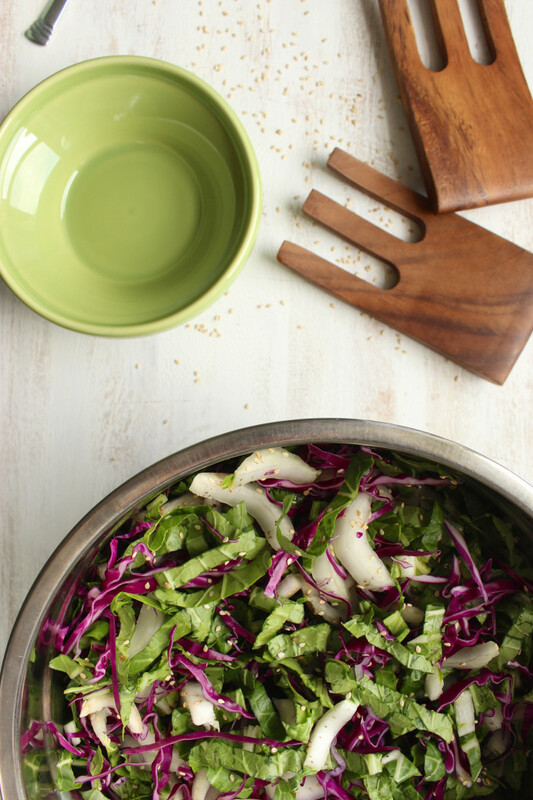 A simple, mess-free recipe for bok choy salad with creamy, tangy tahini dressing. From start to finish, it’s ready in 10 minutes! Wash bok choy and cabbage and prepare as instructed above. 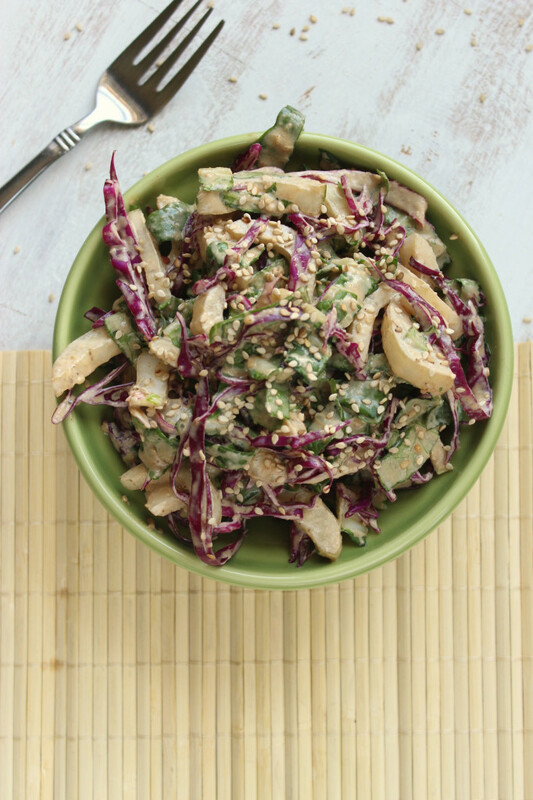 Combine bok choy, cabbage, and sesame seeds in a large bowl and toss together to combine. 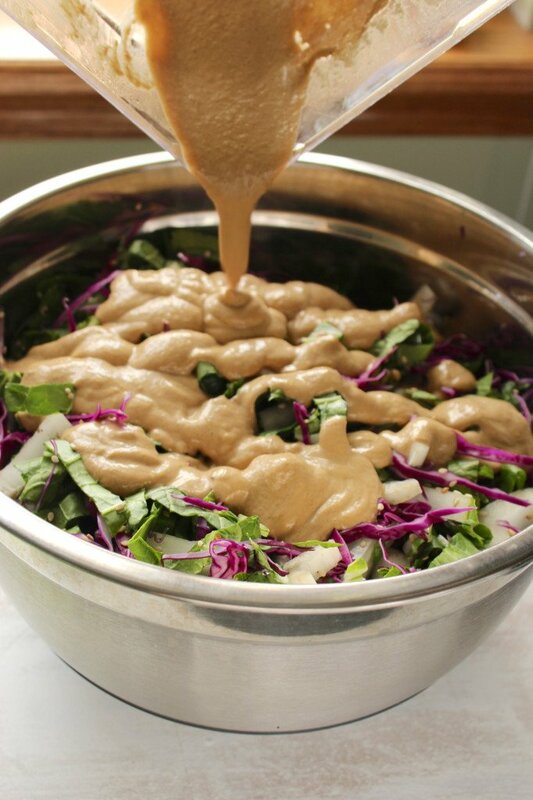 Add ingredients for the dressing to a high speed blender and blend until the consistency is creamy and thickened. Pour dressing over the salad and toss until everything is well-coated. Serve in bowls or on plates and enjoy! Your recipe really inspired me– I live in a cold climate, so I cooked it a little! Just enough to warm the vegetables– I added the dressing after. Thanks! 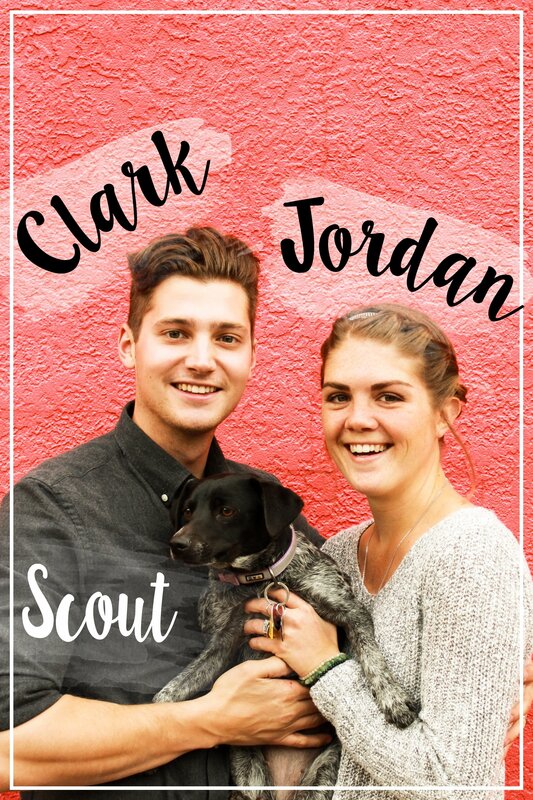 Looking forward to reading more from you! So pumped to try this! I don’t have any white wine vinegar on hand. Could red wine vinegar or apple cider vinegar work? Apple cider vinegar would be your best bet for a substitution! It’s going to taste a bit different than white wine vinegar, but it will be fine. :) Enjoy! This is THE best salad I have encountered. Thank you SO much for the recipe. Super tasty and easy to put together! I didn’t have cabbage so I left it out and used half the honey b/c I don’t care for things super sweet. Thank you for sharing this! Wow!! Soo good!!!! I was raving about it to my mother and she wants the recipe too. I will add some mandarin orange segments and slivered almonds next time. I actually think this will be the salad I take to the next party I’m invited too! Thanks guys. Mandarin orange is such a good idea — my mom always made a slaw with those when I was growing up. Now I’ll have to ask her for the recipe! Hope all your party-goers like it! Perhaps I’m a bit crazy, but I don’t see 6 TB of sesame seeds grinding down into as much creamy tahini goodness as your photos show, without any pre-existing tahini in the dressing. Do they really? 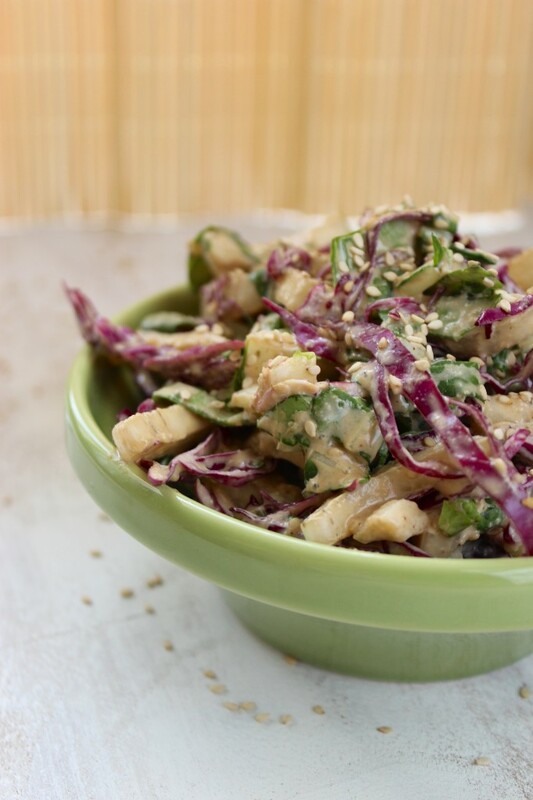 The sesame seeds plus the other dressing ingredients blended together is what creates the creamy dressing. Tons of yum!